Toner refill bottles easily replenish your cartridge. Toner from TonerTopUp slashes your toner costs! Save money by buying a DIY toner refill kit and refilling your laser toner cartridge. TonerTopUp toner fills your toner cartridge and saves up to 87% of the cost of a replacement toner. Toner cartridges can be reused many times. The manufacturers don't want you to refill toner. That’s how they make their huge toner profits! How much will TonerTopUp toner save me? Well that depends on what model printer you have and how you are currently buying toner. We can normally save new clients around 50% on the cost of their toner cartridges. TonerTopUp toner refills fax and photocopier toner cartridges too! It is easy to refill your cartridge! Unplug and pour! - For some laser printers, fax machines and copiers topping up with toner is as simple as removing the toner filler plug or opening the toner shutter and pouring the toner in with our special funnel! Unscrew, unplug and pour! - Others have a few screws to undo first before you reach the toner filler plug. Melt hole and pour! - Some manufacturers make it a little harder and you need to melt your own toner filler hole in the toner cartridge using our special tool. It takes seconds and thereafter the toner cartridge is easily fillable with toner. It is quick and mess-free! DIY refilling takes just minutes. We provide everything you need for a quick, mess-free, professional job. Our funnel top seals onto the bottle making it easy to pour in the supplies. Toner specific instructions are provided for most products. Read general instructions here! All of our powders are specifically formulated for the models for which we supply them. They have been fully tested. We guarantee that they will not damage your printer, neither will they void your warranty! (We do not supply so called “Universal supplies” and professionals don’t use them!) The first time you fill, the quality should be the same as when it ran out. By reusing yourself, you remain in control of the quality of your print. Components in the cartridge will degrade or fail in time, and you can decide yourself when the time has come to start with a new one. Any unused powder can be used in another cartridge so there is no waste. The majority of laser cartridges are disposed of in landfill sites. In the UK this amounts to 10,000 tonnes of material each year. The plastic and other material in the cartridge is non-biodegradable. It does not decompose for many centuries. Each time you reuse a cartridge, you save waste landfill. Ever thought why you change your cartridge when it runs out? It's not because you need to, it's because the manufacturers tell you to. The profit on sales of supplies over the lifetime of the printer is usually far more than the profit on the printer itself. Reusing cartridges is equivalent to filling your car with petrol, only you cannot do it so many times. We supply over 600 types supplies for over 12,000 models. These range from old printers that are still in use, like the Oki Okipage 4 W, to small desk lasers, like the Panasonic KX-FLB751. We supply products for high volume printers from the black only Oki B6200 to the modern colour Panasonic DP CL26 Colour, and for small colour printers like the Oki C3200 colour. Reset required? Some cartridges must be reset so that the printer recognises the new supplies. These have a chip or fuse that shuts down the empty cartridge. We supply replacement chips or fuses, or provide reset instructions for most of them. It's not dead, just add toner! Top up your toner cartridge with our high quality toner and you will give it a new lease of life. After all, you don't scrap your car when it runs out of petrol, do you? Most toner cartridges can be filled with toner several times before essential components begin to wear. Use of colour toner is growing rapidly. Printing with four colours toners and lots of pictures a lot of toner is used. The savings from DIY toner filling can be large. For many models we supply micro-fine "chemical" toner like the original branded toner. This is a new type of toner which is manufactured by polymerisation in solution and not by the traditional process of grinding of the fused ingredients. The resulting fine and even particles ensure high resolution and efficiency so that the colours blend smoothly. 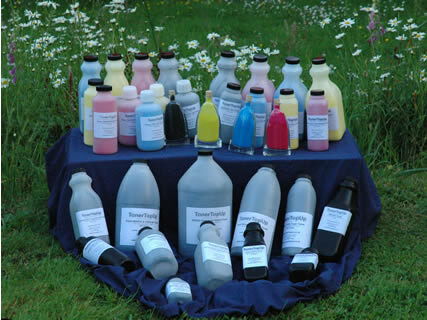 Since colour and finish can vary, we suggest that you test to your satisfaction one bottle at a time. As with all our supplies we guarantee that the powder will not damage your printer and we have an unconditional refund policy for unopened bottles. We use Protx (Name has changed to Sage Pay in April 2009) for secure credit card payments. We never see your card details. You may also pay by Paypal, cheque or bank transfer. Standard UK delivery is by 1st class Royal Mail letter post. About 94% of these orders arrive on the next day. For large orders standard UK delivery is by next day courier. Standard delivery is free for all UK orders over £50 plus Vat. Cartridge 52114502 17,000 pages. This popular all-in-one cartridge is used in modern large Oki printers. It is easy to top up by melting a hole using the special tool in our starter toolkit. The specific instructions have pictures showing where to melt the filler hole in the cartridge. You must replace the chip. Run your cartridges until wear of the imaging drum causes a light print. You won’t notice this for a long time printing text! Toner is £39.70 a bottle. The chip is £18.00 (+Vat). We guarantee that all our powders are specifically qualified for the models for which they are sold and will not damage your printer. We accept back unopened bottles for refund without question.